As of April 1 2011, I have an additional position as extraordinary professor at Eenheid vir Bedryfswiskunde en Informatika of the North-West University, Potchefstroom Campus, Potchefstroom, South Africa. IWOTA 2014 will be held at VU university Amsterdam from July 14 to July 18, 2014. Organizers: Tanja Eisner, Birgit Jacob, André Ran, Hans Zwart. Introduction to Mathematical Systems Theory: Linear Systems, Identification and Control. Birkhäuser, Basel, 2006. ISBN 3-7643-7548-5 Click here for more information. Factorization of Matrix and Operator Functions: The State Space Method. Birkhäuser, Basel, 2007. ISBN: 978-3-7643-8267-4 Click here for more information. A Maple worksheets for section 11.6 is available here , a Maple worksheet for Section 12.5 is available here. 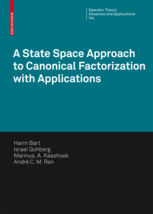 A State Space Approach to Canonical Factorization with Applications. Birkhäuser, Basel, 2010. ISBN: 978-3-7643-8752-5 Click here for more information. Check out the journal Operators and Matrices: The first number appeared in March 2007. The journal aims at top quality papers in the area of operator theory and matrix analysis and applications. Mainly aiming at pure mathematics, the journal will publish good papers of a more applied nature. For more information visit the webiste of Operators and Matrices. Voor diegenen die mijn verhaal bij de alumnidag van 28 Mei 2005 willen nalezen dat kan hier. Dit verhaal was bedoeld voor alumni van wiskunde en informatica, en gaat dus wel iets verder dan wat voor een algemeen publiek geschikt is. Hetzelfde onderwerp, maar dan wat eenvoudiger gepresenteerd, is gedaan op de ouderdag in 2006. De presentatie kan hier worden bekeken. Het verhaal van de ouderdag in 2008 is niet wezenlijk anders. Voor de Brainstorm in Maart 2008 heb ik een verhaal gehouden over gevoeligheid van eigenwaarden onder kleine storingen van de matrix. De slides zijn hier te vinden . Voor wie mijn verhaal bij de alumnidag van 28 Mei 2011 wil nalezen: dat kan. In 2008 the main European congress of mathematics was held for the fifth time. This time it was in Amsterdam, the local organizers were Herman te Riele, Jan Wiegerinck and myself. 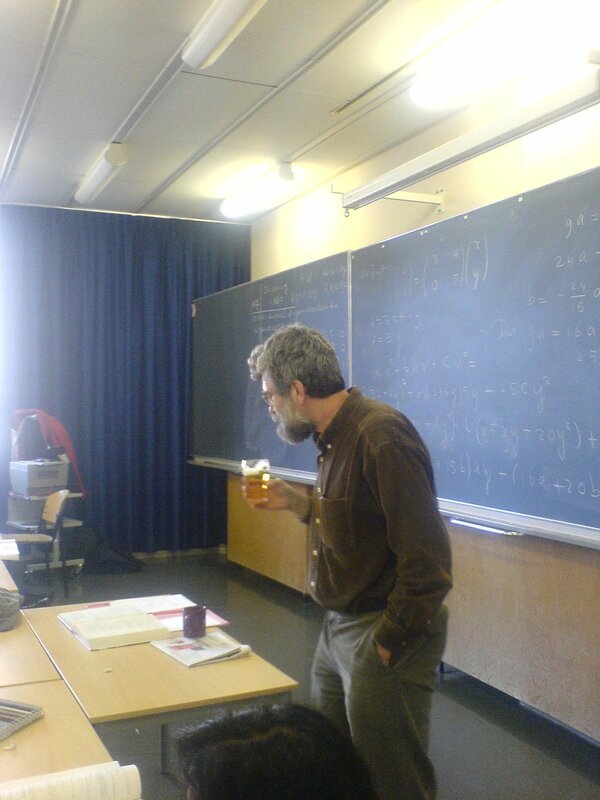 In 2006 the thirteenth conference of ILAS (International Linear Algebra Society) was held at the Vrije Universiteit in Amsterdam. The dates were 18-21 July 2006. The local organizers were Jan Brandts, Andre Klein and Peter Spreij, all from the University of Amsterdam, and myself. For more information see the website of the conference. Lesgeven is leuk en kan soms heel gezellig worden. Dat kun je wel zien aan de volgende foto genomen door William Bakker tijdens een werkcollege Lineaire Algebra voor eerstejaars Scheikunde, Farmacologie en Medische Natuurwetenschappen. Duidelijk is dat op het werkcollege de studenten in ieder geval moeten werken. Dat de docent dat ook doet wordt hiermee niet echt duidelijk, al is het wel het geval. Overigens, het portretje naast de foto bij de contact informatie hierboven dat mij zo treffend gelijkt, is ook door een van de eerstejaars van 06/07 gemaakt, waarvoor hartelijk dank! 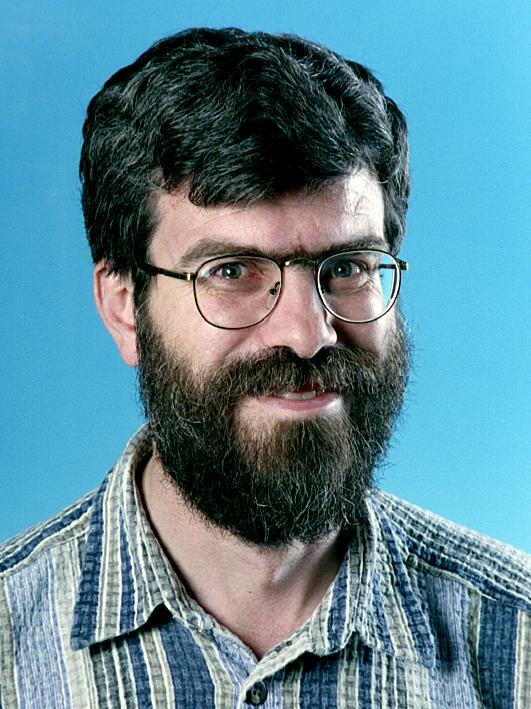 Research interests: Operator Theory, Linear Systems and Control Theory, and Matrix Analysis. Matrices and operators in the context of an indefinite inner product space. This project has several subprojects carried out in cooperation with Leiba Rodman (College of William and Mary) and Cornelis van der Mee (Universita di Cagliari), Christian Mehl and Volker Mehrmann (TU Berlin) , Michal Wojtylak (VU and Jagiellonian University Krakow), and Gilbert Groenewald, Jan Fourie and Dawie Janse van Rensburg(Potchefstroom University). Spectral and J-spectral factorization of rational matrix functions, and the connection with algebraic matrix Riccati equations. This project is a cooperation with Mark Petersen (Potchefstroom University), Leiba Rodman (College of William and Mary) and Leonid Lerer (Technion, Haifa). Nonlinear matrix equations of the type X+A*F(X)A =Q, where Q is positive definite and A an arbitrary matrix, while F(.) is some nonlinear function defined on (a subset of) the hermitian matrices. This project was carried out in cooperation with my former PhD-student Martine Reurings. Click here for her thesis. Inertia theory for invertible hermitian block Toeplitz matrices. This project is a cooperation with Leonid Lerer (Technion, Haifa). Coordination for control. This research topic is carried out in cooperation with Jan H. van Schuppen (CWI and VU) and Pia Kempker, PhD student at the VU. Finite section methods in control problems are studied with Art Frazho and Rien Kaashoek. Place and date of birth: Den Burg Texel, 1-4-1956. University education: Mathematics at Vrije Universiteit Amsterdam 1974-1979.
thesis "Semidefinite invariant subspaces: Stability and Applications". Postdoc: with a grant from the Niels Stensen Stichting I visited the University of California at San Diego (september and october of 1984), Virginia Tech (october 1984-july 1985) and University of Alberta (Calgary, may 1985). Researcher (UD/UHD/Professor) at the Vrije Universiteit as of august 1985. Visiting professor at College of William and Mary, spring 1990. Extra-ordinary professor at Unit for Business Mathematics and Informatics, Faculty of Natural Sciences, North-West University, Potchefstroom, South Africa, as of April 2011. SIAM J. Control and Optimization.